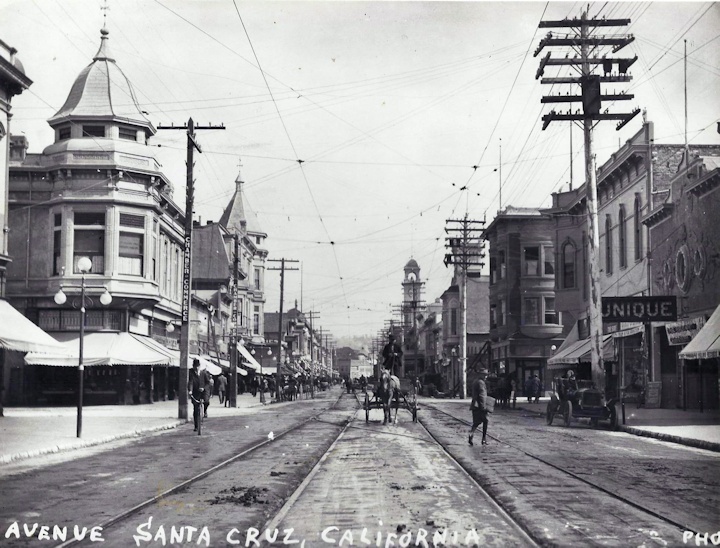 A VERY WIDE PACIFIC AVENUE IN 1910. Look this over carefully, note the two way traffic, note the two trolley car lines, note the cars and carriages parked at the curbs. Yet the stores were exactly as far apart as they are today. That would be at Lincoln Street on the left and Soquel Avenue on the right. Or New Leaf Market where the UniqueTheatre sign is and The Om Gallery and Pacific Cookie Company are on the right. SENTINEL OUSTS DECINZO!!!. This news just in….Steven DeCinzo’s cartoons will no longer appear in the Sentinel. First, they were going to cut him back to just one cartoon on Sundays then Don Miller decided that the free lancers money could be “better utilized elsewhere” and fired him completely!!!!. Steven said the Sentinel was “a nice run” and it lasted longer than he expected. It’s another financial and dissapointing cut and slash at the Sentinel. Of course you’ll always be able to read both classic and some new DeCinzos at the end of every BrattonOnline.com check below. 16,000 UCSC ALUMNI LIVE IN SANTA CRUZ. UCSC Chancellor stated in a column in the Sentinel a week or os ago that 16, 000 UCSC Alumni now live in Santa Cruz. We really have to think about that! That’s about four percent of our permanent population. Add to that the number of UC students living in Santa Cruz and we have some idea of UCSC’s influence on our city. Personally, I like almost all of that influence except their demands for water when they start building their North Campus. SANTA CRUZ COP LINGO. In last week’s column I mentioned that Santa Cruz police refer to “incidents” (trouble) happening on Pacific Avenue as being on the “Oakland” end (Lincoln Avenue going South) or on the “Los Gatos” end (Lincoln Avenue going North). I’ve since been informed the police also call “incidents” happening in Harvey West Park as being in “Middle Earth”. Now we know. MY SPECIAL RADIO GUEST. It is obviously with great pride that I’m having my daughter, Hillary Bratton (pictured right), as my interview guest on Universal Grapevine Tuesday, October 13 from 7-7:30 pm. Hillary’s brand new album, “Tears on My Pillow but the rest of the bed’s OK” is her first, and was just released and is available at iTunes and other such places as Amazon. We’ll be talking about her really interesting and illustrious past and living and working in Paris, New York, and Los Angeles. 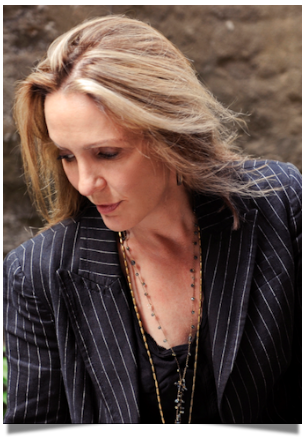 Her career with Sony, Rhino Records, and Apple…and a probably a bunch of surprises for both of us…don’t miss it! Also, while waiting for the radio show, you can read this interview with Hillary! SANTA CRUZ WATER ISSUE. Lynda Francis sent this out a couple of weeks ago…it’s must reading. “We need to include a movement in demanding climate action locally…that is, we can bevery effective here in Santa Cruz. The current council has taken countless actions that go against our own climate action plan and defy reasonable alternatives to counter climate change. Most are not “climate deniers,” but they carry on with business as usual in the face of mounting evidence that we really do need to change old habits—planning, water, public works projects, and transportation. 4) Continued to pave the old way…even though we know this is a major source ofradiating heat, the city continues to use old technology asphalt in the face of newways of resurfacing. 6) Continued to encourage a car-centric city center…no discussion about a Pacific Ave pedestrian mall, but a two-way pro-car approach that was shot down by the fire dept., but now they want to make it one way all the way to the wharf. We must standup and say most people want a pedestrian mall complete with movable street furnitureon Pacific Ave. AND the opening to peds and bikes only of other large thoroughfares(W. Cliff, Front Street, Soquel, Center Street) on a rotating Sunday basis like NYC, LA, Bogota and Mexico City now do with some of their large streets. — Begin the Santa Cruz version of the “ice bucket challenge” that only uses waterfrom the ocean Santa Cruz might not solve the global lurch toward climate change ourselves BUT, we can act locally and our actions are important and will effect other cities…five million people visit here each year and they will see that making positive change is possible. There is so much to be done locally. Maybe we need a follow up to the Climate Action Plan, or a plan with teeth: deadlines and fines and new policies”. Thank Lynda Francis for all of that. WHALE WATCHING LAST YEAR!!! They can’t get much closer than this!!! THE GREAT MORGANI & HIS BIKINI. Morgani the greatest, did a great pantomine at the FashionArt Show last Saturday. Watch very closly. BUD ABBOTT AND LOU COSTELLO IN THEIR VINTAGE YEARS. VANISHING VIDEO STORES. After Sami Abed closed his three video rental stores…Cedar Street Video, East Cliff Video and Video 9 in Boulder Creek, I checked and according to a recent article in the S.F. Chronicle, there aren’t many left in San Francisco either. Remember the days of Blockbuster and Hollywood Video Stores? Well do check out DVD 2 Go at 5171 Scotts Valley Drive across from the turnoff to Scarborough Lumber. Linda runs this amazingly neat and well organized DVD store and it’s been there for 12 years!!! THE RETURN OF LEON PANETTA. Lois and Bert Muhly had an almost infinite number of friends. Lois’s funeral last Saturday (9/26) was a very fitting tribute to both of them. John Laird officiated and about mid way through the friendly and informal tribute introduced Leon Panetta. Leon had appeared at Bert’s funeral a while back. Leon was in fine fettle and had us all laughing over some wonderfully shared memories. KUSP NEWS. LIVE COVERAGE AND FIRINGS. Seems like the troubles never end at KUSP. Now that station manager Terry Green has left the building and some board members have resigned let’s hope that IF the station survives they’ll bring back all the live broadcasts that they cut in the last year. Many, many live classical and other musical events went by the wayside, with no notice to or from anyone. MORE ABOUT “WRENCHED”. I’ve seen the film since last week and need to tell you what an important film it is. It’s almost a primer on Anarchy and the real meaning and practice of Anarchy, and how historically it has changed communities for the better. It’s also a “how to” lesson on blocking traffic, using chains and barrels and arrests for achieving victory. Maybe more than all of that… it’s how greed, money and the establishment (Land Trust) cries for GROWTH ruin wilderness (The proposed Cotoni National Monument) . All we have to do is see what development has done to the wilderness that was once Wilder Ranch. See this film. I’ll meet you there. WHICH HOMELESS ARE WE TALKING ABOUT??? We really need to be more careful with labels. Far too many well-minded folks use “Homeless” to describe who they mean instead of “travelers” or some such word. Any thinking person knows that there are true homeless by the hundred of thousands in the USA and around the world today. The “travelers” (as Mayor Don Lane suggested) that apparently hang out on Pacific Avenue at both Los Gatos and Oakland ends are there by their choice of lifestyle. MARIN ALSOP’S LAST YEAR!!! So just one more season with Marin Alsop leading the Cabrillo Festival of Contemporary Music. That’ll be an exciting change. I go back so far with the Festival that I was on the Board when they let Carlos Chavez go, Marion Taylor and I think it was Bud Kretschmer went on a long time search and found Dennis Russell Davies back in St. Paul, Minnesota to lead the Fest for many more years. He made great opening appearances by riding his Harley Motorcycle and having hair down his shoulders!!! Maybe, just maybe they’ll ask composer John Adams (“The Death of Klinghoffer”, “Nixon in China”) to give us another try?? There was some awkward exchanges when he almost joined us just before Marin did. As reported in the Sentinel, about 50 people showed up at the Aptos Grange to hear what Planning Code Modernization is all about. 2nd District Supervisor Zach Friend welcomed everybody in attendance, and reminded them that although many people were there to talk about the Aptos Village project. that wasn’t on the agenda. However after the meeting was turned over to the Planning Department, many people wanted to talk about the Aptos Village Project anyway, and continued to be critical of it. It’s too bad this meeting wasn’t held years ago before the Project got county approval. At least it could have been counted as “one of over 20” meetings that were supposedly held. Many of us wished that the Aptos Village Project would have received the same scrutiny that today’s Planning Department is giving to holding weddings in residential neighborhoods. Lots of important things will have been decided by the County Board of Supervisors at their September 29th meeting. All will have an effect on county residents that could increase housing density near already densely populated areas of both city and county neighborhoods. It’s beginning to look like we’re being asked to rush these changes through to ease the County Planning Department’s workload by making it easier for developers to do their thing. They are allowing the public four whole days to review their “code modernization” changes that they have working on for many months. It will be interesting to see how the supervisors handle this issue. I hope they extend the review period after answering these questions: How many of my constituents are for these changes? How many developers are for these changes? What’s the rush to make these changes? NOAM CHOMSKY CONFRONTS A RIGHT WINGER. Be glad Chomsky is out there and still fighting the good fight. 1. Investigate (a pilot project along with the requested change) a two way bicycle path from the Town Clock to the intersection with Front St . This would probably necessitate elimination of some parking spaces but would be consistent with stated Council goals of reducing, not increasing, auto traffic. In any event, bicycles will undoubtedly continue to go two ways on Pacific regardless of legality and safety. 2. Consider eliminating all two way sections in this area. I cannot see why retaining these is reasonable. This may also assist in the desired development of the lower part (Oakland end) of what we used to call the Mall. 3. Consider an occasional, perhaps one Sunday a month, closure of Pacific so there may be a trial pedestrian mall. I know this is very controversial but that surely does not mean it is unreasonable. There are malls that are highly successful and others that have flopped. Careful planning and policing would be essential and might make the Mall as desirable as those in, say, Burlington, Vt, or more recently Times Square and a number of European cities. This also is consistent with Council global warming policies. THE CORRIDORS PLAN;THEIR VISION, OUR NIGHTMARE. I attended the city’s Corridors Planning and Zoning Update workshop recently held at Bay View Elementary school. I knew what to expect and I was not disappointed. Urban planners from San Francisco, senior city planning staff and commissioners, large maps, colored markers and a few residents. I had urged a couple of long-time Santa Cruzans to attend. They live near the Bay and Mission “node” which is one of the areas targeted for high density residential, mixed use and commercial development. They left in disgust. My eye spotted a wall chart with the heading: What This Plan Doesn’t Do. Listed beneath that heading were: “It won’t increase density significantly beyond what is already allowed on the corridors” and “It won’t tear down existing development.” Since the Corridors Plan will do exactly those two things, I caught the attention of a member of the SF Urban Planning team and told her I found those statements misleading. She nodded in sympathy and tended to agree. I’ve attended a number of public meetings on planning issues at Bay View Elementary over the past 40 years. Gone are the days when neighbors had a chance to voice their opinions and concerns on the issue of the time. Now, city- funded consultants camouflage the main issue with carefully constructed questions that deflect the topic to side issues such as “what are your current three main concerns about Mission Street?” My concern is with the Corridors Planning and Re-Zoning Update. The structure of the workshop doesn’t allow that to be discussed. City Councilmember Richelle Noroyan will be sponsoring a Pacific Avenue One-Way Traffic Project that will be presented to the City Council by the City’s Public Works and Economic Development Departments during the September 29, 2015 City Council meeting. The proposal is to convert a one-block segment between Walnut Avenue and Lincoln Street to the opposite direction, and to convert a three-block segment between Church Street and Cathcart Street to a continuous one-way southbound direction. If approved by the Council, the proposed construction date is after the first of the year in 2016. Last Thursday (9/17), the City of Santa Cruz Planning Commission held an important public hearing, and voted to support a proposed development at 1800 Soquel Avenue, consisting of two three-story mixed use buildings. The site is located at the corner of Soquel Avenue and Hagemann Avenue, right across the street from Walgreens, for those who know the Soquel Avenue corridor, and who would like to be able to picture exactly where the development would be. An article in the Santa Cruz Sentinelcalled the proposed project “controversial.” The meeting took four hours, and the Sentinel says two dozen speakers expressed concerns, with both traffic and parking being the big issues. The “Nextdoor” online bulletin board for the Eastside/Branciforte neighborhood carried a report from a resident who attended the meeting. That person said that the Commission’s logic was that<quote> “if they make parking bad enough, people will be forced to use other transportation.”` The commenter made clear that he wasn’t advocating that approach, only reporting what he had heard from the Commission. The project still has to go before the City Council, so if you care, you can still weigh in. In addition, this project is a good example of what the City is planning for the Soquel Avenue, Water Street, Mission Street, and Ocean Street corridors. As I’ve reported before, a planning process is underway. Plans govern specific projects, so get involved early, not late! The “market” system is supposed to make things affordable. The price of peanuts is set at a point at which the demand for peanuts and the supply of peanuts is in balance. If there isn’t enough supply, the price will rise, and more peanuts will be produced. If there is more supply than demand, the price will fall. The housing market is not like the market for peanuts. Demand comes not just from people who need to have a house to shelter themselves, but also from those who want to invest in the real estate market. Investors don’t want housing for its own sake, and they price ordinary people out of the market. Consider Carmel. Something like fifty percent of the housing in Carmel has been purchased by people who don’t even live in our region, and who have out-competed local workers and their families, in terms of price. CLASSICAL DeCINZO. 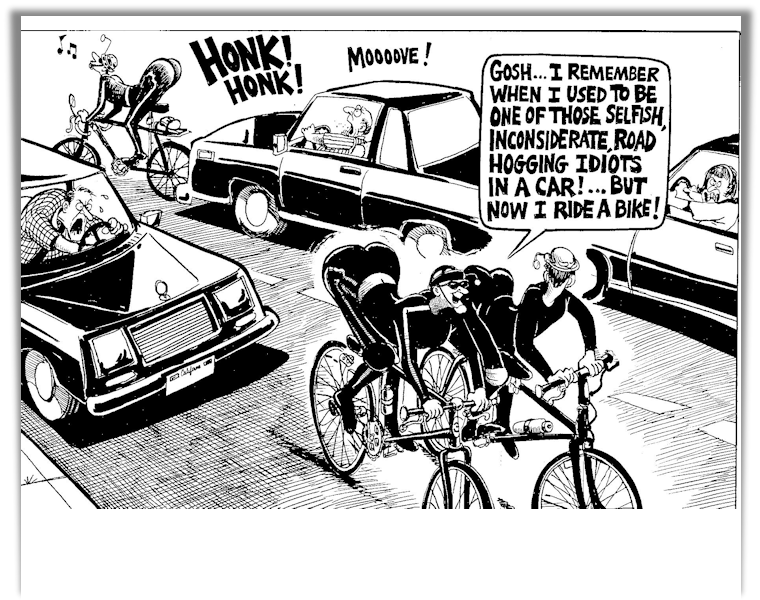 DeCinzo and the cyclists..go head on. See below just a bit. EAGAN’S DEEP COVER. Freedom by any other name would smell… etc. See Tim’s weekly aside, scroll downwards..
LISA JENSEN LINKS. Lisa writes: “Every word counts this week at Lisa Jensen Online Express (http://ljo-express.blogspot.com), as I consider the art and craft of the final book edit. Also, author Kate Forsyth delves deeper into fairy tales in The Wild Girl, Captain Hook invades Project Runway, and Alias Hook tops a list of recommended reading in Entertainment Weekly!” Lisa has been writing film reviews and columns for Good Times since 1975. BREATHE. A French film with subtitles, this is the best film I’ve seen in months…or longer. Two teenage girls and their intense relationship are so subtly portrayed and beautifully acted it’ll rip your heart out. It’s intense, and beautiful, and very rare. See this film and do it quickly. 92 % on Rotten Tomatoes. TIME OUT OF MIND. Once in a while the film distributers tell our Nickelodeon that “you can only show this film for a week right now and maybe later on you can screen it longer”. That’s show bizness. Richard Gere does one of his finest acting roles as a Homeless guy in New York City. He’s almost mute and mentally disturbed after a head injury. Jena Malone, Kyar Sedgewick, Steve Buscemi, Ben Vereen, all do great jobs and are nearly unrecognizable. It’s slow and thoughtful in parts. You’ll be glad you saw it. SICARIO. Remember Javier Bardem the ruthless assassin in “No Country for Old Men”? Well Benicio Del Toro almost outdoes him in Sicario. Emily Blunt tries her best to act like a Federal agent (FBI) assigned to shady drug deals along the Mexico-El Paso border. Josh Brolin is the seasoned government agent who’s trying to stop the Cocaine, pot, drug trade being tunneled into the USA. It does a great job depicting the politics (ours and Mexico’s ) and shady acts that both sides deal with every day in this ongoing war. It’s an unusual action film, go if you like action films with a hint of truth. THE MARTIAN. This Hollywood Matt Damon starring film is like George Clooney and in Gravity. It’s about Damon being left behind on Mars by his team mates (Jessica Chastain, Kristen Wiig, and Michael Pena). Chiwetal Ejiofor and Jeff Daniels are the NASA, Pasadena JPL business men in charge. It drags in spots and the FX look like they stole them from “2001”. Matt Damon is just too cute and funny and extraordinary to be real, but go see it. You’ll stay awake just to see how it all works out. It’s tense near the end but the ending itself is corney. COMING HOME. Gong Li is the now aging star of this Chinese Cultural Revolution family/Political film. Gong Li was born in 1965 and she film debuted in 1987!!! With her husband jailed politically for years Gong Li slowly goes mentally unbalanced while she waits for him. The plot is about hos he returns home and she can’t recognize him. Tearful, sad, subtitled, heart breaking, it almost gets too melodramatic, but it is well worth seeing. GOODNIGHT MOMMY.This film from Austria (subtitled) is a genuine horror film. Almost no blood, no chain saws, cellar stairs, just horror. Identical twins (on and off screen) are very suspicious when their mother returns from the hospital after an accident with her face completely bandaged (covered). Maybe she’s not their Mom??? You’ll stay affixed to the screen right up to the last surprise…go see it IF you like squirming and excellence in good movies. PAWN SACRIFICE TRAILER. Even if you don’t like Chess…see this film. PAWN SACRIFICE. Tobey Maguire really brings life to his role as the crazed Bobby Fisher, world chess champion. Liev Schreiber plays Boris Spassky equally well. It’s about chess as an international political game as well as a mind destroying career. It’s an excellently made film and is as exciting and tense as any film you’ll ever see. Don’t miss it. BLACK MASS. Now our very own and only Santa Cruz- born-movie star Adam Scott can shorten the degrees of separation to Kevin Bacon. Adam has an almost non-speaking role (with moustache) as Bacon’s FBI assistant Robert Fitzpatrick. This saga of the very real true life monster/gangster “Whitey” Bulger stars Johnny Depp in one of the very best screen roles in his career. It also stars Benedict Cumberbatch doing a great Boston accent as Whitey’s brother. Full of violence, this film is apparently really accurate. Read last week’s New Yorker (Sept. 21st) for even more about Whitey. There was an earlier documentary (2014) titled “Whitey” details at http://www.imdb.com/title/tt3326366 . What’s odd is that the Rotten Tomatoes website has removed Adam’s name and role from the credits (it was there) but you can still see a list of all his works at IMDB. EVEREST. What a cast!!! Jake Gyllenhaal, Josh Brolin, Robin Wright, Keira Knightly, Emily Watson, and Sam Worthington. The problem is that with all the grunting, straining, climbing and white-outs you can’t tell one from another. If you saw and liked Meru this film is a downer and can’t compare with reality. Everest is a 3D Hollywood attempt at showing how hard it is to commit to climbing…and living. The odd thing is that Everest is mostly about climbing DOWN the mointain while Meru was about climbing UP. It’s exciting, grim, and people die. Go warned, it’s not real. LEARNING TO DRIVE. It really should be called “Driving Miss Crazy“. Ben Kingsley plays an East Indian Sikh cab driver who also teaches driving. Patricia Clarkson is the disturbed, ditzy, soon to be divorced, book critic. She has a daughter Grace Gummer who of course tries to pretend she’s not Meryl Streep’s real life kid. This meaningless, pointless, movie is not only tripe but like so many other paper thin movies makes so called “innocent” fun of racial stereotypes. SLEEPING WITH OTHER PEOPLE. Santa Cruzan star Adam Scott shows up in this Woody Allen imitation movie. Scott wears goofy glasses and plays a two timing goof, but he does it well. Critics call these movies “rom-coms” now but this one isn’t romantic or comedic or worth your time or money. Just bitchy unlikable New Yorkers you’d never want to meet. MAZE RUNNER: The Scorch Trials. I liked the first Maze Runner. Mostly I liked the MAZE itself. Huge sliding walls crushing anybody without proper timing between them. This new movie has no MAZE walls at all. Just a bunch of Hollywood type teen agers running through basements and parking garages trying to escape the evil Queen…who, oddly enough is played by Partricia Clarkson the ditz in Learning to Drive. Don’t even watch this at a friend’s house who Netflixed it! THE VISIT. Another M. Night Shyamalan directed flop. This sad imitation of a scary film has grandma and grandpa as evil spirits..or something. I walked out after waking up to grandmother asking her grandaughter to climb inside the oven to clean it. UNIVERSAL GRAPEVINE. Each and every Tuesday from 7:00-8:00 p.m. I host Universal Grapevine on KZSC 88.1 fm. or on your computer, (live only or sometimes old programs are archived… (See next paragraph) and go to WWW.KZSC.ORG. Jinx Deruisa from The Santa Cruz Chamber Players and Rebecca Jackson take the stage on Sept. 29, after which Robert Stayton will talk about solar energy and his new book “Power Shift” On October 6 Patrice Vecchione returns with news of her newest workshop. After which Amber Duncan and Courtney Castanos from the Ramblin’ Adventure Club talk about their kid’s programs. UNIVERSAL GRAPEVINE ARCHIVES. In case you missed some of the 900 + great people I’ve interviewed in the last 9 years here’s a partial list of some past broadcasts. Such a wide range of folks such as Nikki Silva, Michael Warren, Tom Noddy, Anita Monga, Mark Wainer, Judy Johnson-Darrow, Wendy Mayer-Lochtefeld, Rachel Goodman, George Newell, Tubten Pende, Gina Marie Hayes, Rebecca Ronay-Hazleton, Miriam Ellis, Deb Mc Arthur, The Great Morgani on Street performing, and Paul Whitworth on Krapps Last Tape. Jodi McGraw on Sandhills, Bruce Daniels on area water problems. Mike Pappas on the Olive Connection, Sandy Lydon on County History. Paul Johnston on political organizing, Rick Longinotti on De-Sal. Dan Haifley on Monterey Bay Sanctuary, Dan Harder on Santa Cruz City Museum. Sara Wilbourne on Santa Cruz Ballet Theatre. Brian Spencer on SEE Theatre Co. Paula Kenyon and Karen Massaro on MAH and Big Creek Pottery. Carolyn Burke on Edith Piaf. Peggy Dolgenos on Cruzio. Julie James on Jewel Theatre Company. Then there’s Pat Matejcek on environment, Nancy Abrams and Joel Primack on the Universe plus Nina Simon from MAH, Rob Slawinski, Gary Bascou, Judge Paul Burdick, John Brown Childs, Ellen Kimmel, Don Williams, Kinan Valdez, Ellen Murtha, John Leopold, Karen Kefauver, Chip Lord, Judy Bouley, Rob Sean Wilson, Ann Simonton, Lori Rivera, Sayaka Yabuki, Chris Kinney, Celia and Peter Scott, Chris Krohn, David Swanger, Chelsea Juarez…and that’s just since January 2011.